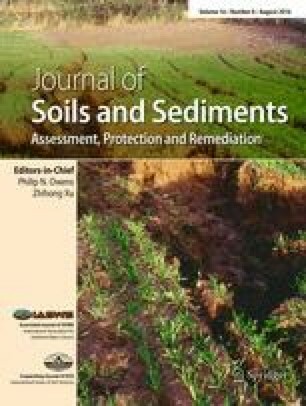 The synthetic soil based bioremediation approach as reasonable and sustainable practice at the farming level where desired bioremediation could be established at lower cost. Metal-tolerant bacteria from different environmental field samples, (a) a municipal dump site, (b) an agricultural field and (c) sludge of electro-plating industries, were screened and characterized. Bioremediation of metal contaminants through isolated bacteria was compared under two different conditions, synthetic soil and basic minimal media containing copper, cobalt and nickel. The pollutants arising from industrial effluents are imparting a huge negative impact on agricultural land. Microbes are predominant in heavy metal-contaminated sites, which signifies as a potential opportunity for the researchers towards bioremediation. Three bacterial species showed high metal tolerance; 16S ribosomal DNA (rDNA) analysis revealed that the organisms were Proteus vulgaris strain, Stenotrophomonas sp. and Bacillus thuringiensis. Percentage removal of metals was also analysed under different concentrations and pH. The current tested methods are helpful in streamlining the natural compliance of fragile elements and its uptake into the microbial system under in vitro and in situ conditions. Manoj Kumar and Vivek Kumar contributed equally to this article. This research was supported by the Amity University Uttar Pradesh and Lovely Professional University, Punjab, India. The authors are grateful to the University for the support. MK and JS both are having joint corresponding authorship based on the equal contribution. MK, JS, VK, AV, AP, AKS and AA were involved in manuscript designing and data interpretation. AP was involved in sample collection and analysis. JS and RP were involved in the statistical analysis. All authors read and approved the final manuscript.